Whole grains are the entire seed of a plant, referred to as a ‘kernel’. 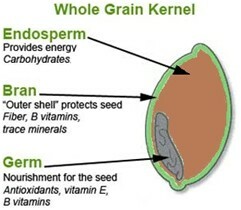 During the processing of whole grains, the husk (outter shell), the bran (contains fiber), the endosperm (contains starch) and the innermost germ (contains minerals and nutrients) as shown in figure 1. During the processing of whole grains, everything is removed leaving not much more than the endosperm which has a small amount of nutritional value. By contrast, 100% whole grains contain an intact kernel loaded with vitamins, minerals (noticeably B vitamins, vitamin E, zinc and magnesium) and a variety of antioxidants. Try to pick carbohydrates when the first ingredient on the label has the word 100 whole in it. Additionally, many natural foods are good sources of dietry fibre including fruits and vegetables (raspberries, blueberries, blackberries, pears, potatoes with skin, broccoli, corn, apples with skin and bananas. Other sources worth mentioning; oatmeal, raisin bran, all bran, kashi, a variety of beans and nuts. Despite all the health benefits, there may be times you shouldn’t eat foods containing too much fiber such as during performance. Although slowing the movement of food through the digestive process may enable prolonged periods of energy, it may prevent a quick burst of energy which is sometimes needed. For that reason, it is suggested that it shouldn’t be consumed too close to or during exercise.